In Dead Wake, Larson sets up all the major players for us; the White House, the British Admiralty, the German U-Boats, Captain Turner with his crew and passengers. He then meticulously draws out the sequence of events leading up to the sinking of the Lusitania, and asks the question: Could the sinking of the Lusitania have been prevented? There were 1,959 people on board the Lusitania when it sank. Only 764 survived. To me, this sounds like a ridiculously low number considering the fact that they had all the lifeboats required, as well as lifejackets for everyone on board. They also had a captain who knew what he was doing, even if some of his crew were not up to his standards. They were warned that U-boats were in the area, they were not too far from shore. So, what happened? Why so many lives lost? Why should they have been torpedoed at all? I learned so much from this book. I learned, of course, the story behind the sinking of the Lusitania. But the book includes so much more than that. We get a glimpse of major events going on in the world while the drama on board unfolds. The politics of WWI and the question of when America will be joining the war, the secrets of Room 40, the ins and outs of living and working on a submarine, the staggering amount of coal needed to fuel a ship the size of the Lusitania, a look into the romantic life of Woodrow Wilson, the treatments for depression in the late 19th and early 20th centuries, popular actresses and films at the time, and the popularity and science of spiritualism. It’s fascinating to read about people who really lived – the ordinary people as well as the better known ones. There are the historical political figures, of course, like Woodrow Wilson and Winston Churchill. But, I enjoyed just as much reading about the array of passengers aboard the Lusitania; Charles Lauriat, a bookseller who had some valuable items on board the ship; Theodate Pope, an architect and spiritualist suffering from depression; Dwight Harris, a man traveling to England to propose to his girlfriend; Margaret Mackworth, a woman dreading going back to her dead marriage of 7 years; Elbert Hubbard, the soap salesman turned author who was traveling to Europe with the goal of interviewing Kaiser Wilhelm; and others, including many families with children. Then there was Captain Turner and his quiet, solitary life. And, the Captain of the German submarine who did the damage, Walther Schwieger – Larson makes him sound like an ordinary, likeable guy just going about his job of sinking ships. 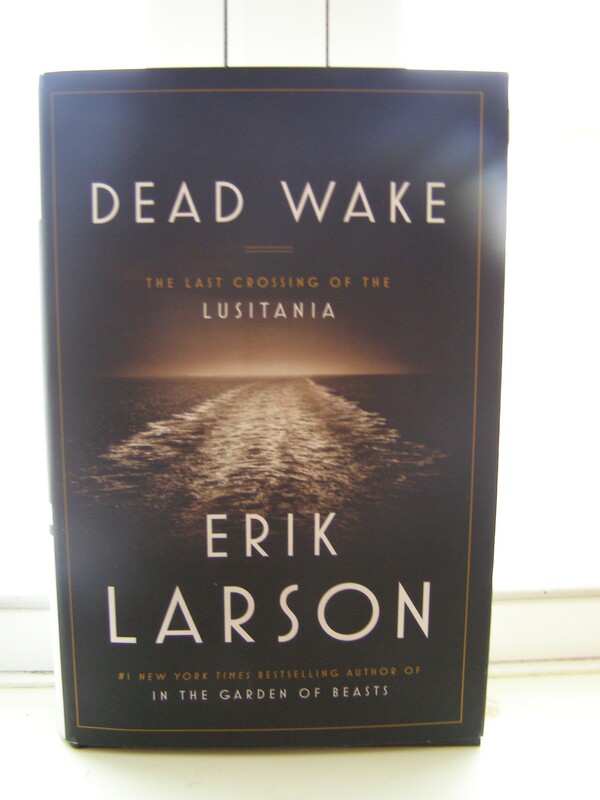 Larson presents a stark contrast between the fighting in Europe and days spent on the Lusitania; the devastation of the trenches and the languid days on deck. Tensions were higher than usual on the Lusitania, but most of the crew and passengers believed the boat was unsinkable, especially with the anticipated escorts from the British Navy (the ones that never came). Larson definitely knows how to build the tension. At the beginning of the book he takes his time setting it all up, but once it got going, I had trouble tearing my eyes from the page. Even though it is a story whose ending we all know, I found myself feeling nervous and hoping the author would find a way for it all to be avoided. As the time on board ticks away, the narrative takes us from passenger to passenger, painting us a picture of where everyone is, what they are doing, and even what they are thinking or saying to each other at any given time. All the while, I wanted to yell at everyone to pay attention! When he got to the part about the children being spread out around the ship and their parents frantically trying to gather them up, I wasn’t sure if I wanted to keep reading. Then there was the horror of people not knowing how to put their life jackets on properly. In the end, the U-20 Captain couldn’t even stay to watch. The book takes us right up until the United States decide to join the war on April 6, 1917. By then, the Allies had suffered greatly, and they were cheered by the prospect of new support coming from America. Bernard Gribble captured the scene of the May arrival of the American ships in his famous painting, The Return of the Mayflower. I have seen so many book bloggers rave about Erik Larson’s books that, when I saw this new one coming out, I took it as my chance to finally read one of them. It won’t be my last. Which one do you recommend I read next? 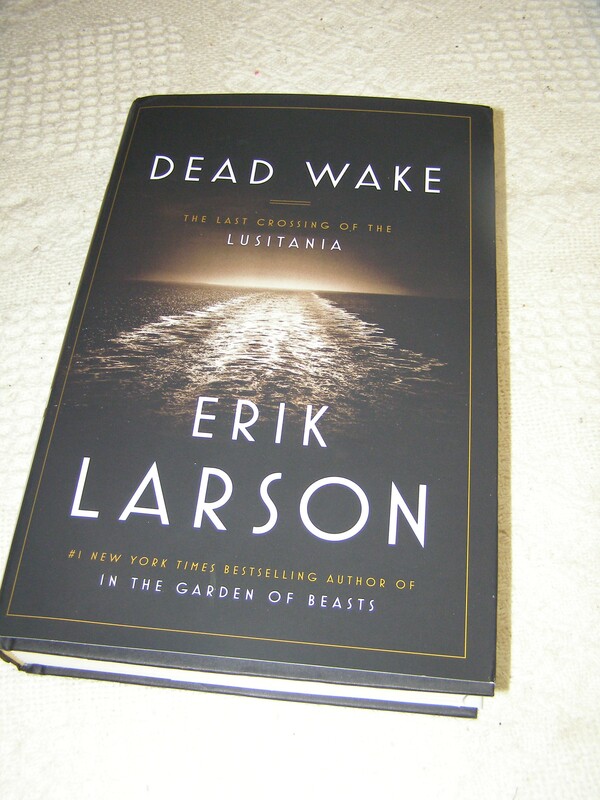 If you have read Dead Wake, how does it compare to the others? I liked Devil in the White City (i think that’s the title). He is really good at literary non-fiction. I’d read this one, but i have an irrational fear of being in a sinking ship. Oh, maybe you better stay from this one, then! Thanks for the suggestion – The Devil in the White City is probably the one I’ve seen around the most. I’ve been keeping an eye out for this book. Haven’t seen it when I’ve been out shopping yet, though! I think The Devil in White City is his best, to answer your question. Or, rather, it is the one I found the most interesting, although all his books have been good. That’s the second vote for The Devil in the White City. Why do I feel drawn to Isaac’s Storm? That one is good, too. I think that might be his first book. They’re all good. I don’t think you could go wrong, whichever one you pick. Good to know, Kay. Thanks! Three votes for The Devil! I was nervous when I requested this one – my track record with non-fiction isn’t great. But, everyone seems to love his books, so I wanted to try it, and I’m glad that I did. Interesting – the research sounds amazing. Does it read more like fiction or non-fiction? You can tell that it is non-fiction, but it reads a lot like fiction. And, it’s fun to read something that you know is 100% true without being dry and boring. If you are a person who prefers fiction, I think you will still enjoy this book. If I read non-fiction, I do like it to be about what it really is to live someone else’s life, which is what struck me about your review. Also I love the artistry of someone gathering all that research and using it well. My complete opposite pet hate is historical fiction that jars me out of the moment by making me think – that doesn’t sound true?! I was truly impressed with the amount of information the author had gathered up and re-distributed to tell a good story. And, I feel pretty confident that you won’t feel like it doesn’t ring true. Oh I’m SO GLAD that this book converted you. “Even though it is a story whose ending we all know, I found myself feeling nervous and hoping the author would find a way for it all to be avoided.” <– I think this really sums up the way that Larson writes non-fiction. The Devil in the White City was the first of his I read but my favourite was In the Garden of Beasts. I think it might be tied with Dead Wake now though because that was just perfect. Dead Wake was just what I was hoping it would be. Lots of good stuff to learn, but still so compelling. I’m glad I took a chance on it, and I’m excited to read more of his books. Yours is the first (almost second) vote for The Beast. I am assuming that I will soon get to hear what you have to say about Dead Wake? Can’t wait! I found that The Devil took a long time to get going. But then of course it was like “WHOA.” The Beast was more even that way – the whole thing was “whoa”. Hi! I’m a little jealous you got a publisher’s copy of this one. I haven’t read it yet, but it’s definitely on My List. Erik Larson is so good at making nonfiction extremely readable even for those with a strong preference for fiction. Hard to say what your next Larson read should be. “Isaac’s Storm” and “Devil in the White City” are both good reads, but if you think you might like to move along to pre-WW 2 years in Berlin, you may want “In the Garden of Beasts,” also very good …. Have you tried any Simon Winchester yet? You could find yourself enjoying some of his work too (The Professor and the Madman comes to mind; also Atlantic, The Crack At the Edge of the World (about the California earthquake of 1906), The Map That Changed the World, etc. etc. I actually have two of Winchester’s books, one of which has been in my TBR pile for a long time (The Professor and the Madman). The other one I have is The Map That Changed the World. Which one did you like best? I got a review copy of this too, and I really enjoyed it. It’s just like you said — I knew what was coming, and somehow I kept hoping it wouldn’t be true. Larson does a great job of keeping the momentum high. I didn’t enjoy this book nearly as much as Devil in the White City, which is slower paced but much richer and more interesting, in my opinion. I’ve also heard fantastic things about Isaac’s Storm, which I haven’t read yet, and Thunderstruck is waiting on my shelf at home! He’s a reliably good author; he makes non-fiction entertaining. Glad you liked this one! I’d also recommend Walter Lord’s A Night to Remember if you’re in the mood for something similar, which is about the Titanic. Fantastic book. It sounds like I’m pretty much guaranteed to like the rest of Larson’s books – it just depends what subject I’m in the mood for. Thanks for the Walter Lord suggestion – I’ve never heard of that one. I do like sinking ships. Sounds morbid, doesn’t it? It does, but I’m right there with you! This sounds great. He’s an author I’ve seen reviewed a lot in the blogosphere but I’ve not yet read any of his work. I recently added a whole bunch of sea-faring true life stories to my wish list after I fact-checked and sub-edited an article about “books every keen fisherman should read” for a magazine I freelance on. Dead Wake would fit right into that theme perfectly! Dead Wake would definitely fit nicely onto your list. This is the first of his books I have read, and the fact that it was about a sinking ship made me feel pretty confident that I would like it. Now that I’ve experienced his style of non-fiction, I think I would like his other books, as well. There are a number of first class history writers these days. Larson is one of the best. He really seems to know what he’s doing. It must be a staggering amount of work to research everything and then put it all back together in a way that makes it so compelling. Do have others to recommend? Not really. But I highly recommend Pat Barker’s World War I Trilogy. I think you would like them a lot. Great review! Wow, it’s almost like the Titanic. I like the stories of the regular people who were also on the ship. I can’t wait to read this book, just waiting for it to come in at the library … as usual. I’ve only read In the Garden of Beasts by Erik Larson and the historical information was interesting, but I didn’t care too much about the American family he focused on. I really think my next book by him will depend on my mood and the topic I feel like reading about at the time, although there hasn’t been anything at all said against The Devil in the White City. I’ve heard nothing but good things about The Devil in the White City, so I don’t think you can go wrong starting with that book. It’s a good thing I didn’t see those reviews. This was my first experience with Erik Larson, and as a person who prefers fiction over non-fiction, I was tentative to try it. But, I am so glad I did. If you liked one of his other books, I think you will also like this one!